ALTAYA JAMES BOND 007 COLLECTION - TUK TUK 3-WHEELER 1:43 SCALE. 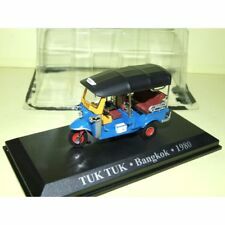 Tuk tuk taxi BANGKOK (thailand) 1980 1:43 mint!!! This page was last updated: 20-Apr 12:15. Number of bids and bid amounts may be slightly out of date. See each listing for international shipping options and costs.